Maria Solano was appointed as the UKIIMEA insurance industry chief technologist in May 2018 to design cohesive solutions combining the different DXC capabilities considering customer needs, the industry landscape, and relevant innovative trends across industries. 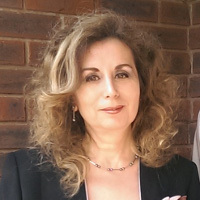 Previously she served as the chief technology officer for the Department of Work and Pensions and other government departments and financial sector clients in the UK and EMEA. She has worked in IT for 24 years in various industries, predominantly government, finance and defence, acting in various roles such as technical authority and enterprise architect.